This paper was commissioned by the Regional Plan Association in 2007 for the Rockefeller Urban Summit, and is courtesy of America 2050. Professor Fishman teaches in the urban design, architecture, and urban planning programs at the University of Michigan. He has authored several books regarded as seminal texts, on the history of cities and urbanism including Bourgeois Utopias: The Rise and Fall of Suburbia (1987) and Urban Utopias in the Twentieth Century: Ebenezer Howard, Frank Lloyd Wright, and Le Corbusier (1977). His most recent work is on exurbs. 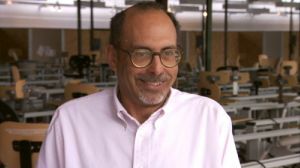 Professor Fishman is also a featured interview in Blueprint America: Beyond the Motor City. National planning in this country is widely believed to be an un-American activity, an exercise in bureaucratic hubris best left to the French. In fact, national planning is as American as the family farm, the transcontinental railroads, the great hydro-electric dams of the South and West, and the interstate highway system. Not only were these and other characteristic elements of our culture and economy the product of national planning; the federal government itself was created in large part to overcome the barriers to national planning that existed under the Articles of Confederation. Indeed, I would argue that no other nation has been so profoundly planned as the United States. In this paper I will discuss the two great “campaigns” of national planning that have profoundly shaped this country: the 1808 “Gallatin Plan” of roads and canals whose themes guided long-term federal policy through the 19th century, and Theodore Roosevelt’s 1908 set of conservation and transportation initiatives that guided the 20th century. My purpose is not merely to correct some myths about American history. As we approach the centennial anniversaries of these two great plans, we might ask: What elements in our tradition of national planning are still valuable and powerful? Where is the new vision for 2008 that can build on the achievements of 1808 and 1908 to reshape the nation over the next century? The first great national plan bears the name of Thomas Jefferson’s brilliant Secretary of the Treasury, Albert Gallatin, although his 1808 “Gallatin Plan” owed as much to Jefferson himself as to Gallatin. It embodied perhaps the most revolutionary vision of any national plan: the creation of a truly democratic society through the planned settlement of a whole continent. The sale of federal lands would be organized to produce a society dominated by independent farmers, and this new continent of citizen-farmers would be connected to thriving cities and their world-wide markets by a federally-financed network of roads, and canals (and later railroads) to form the world’s most productive economy. This vision dominated the 19th century, reaching its climax during the Civil War years when Lincoln definitively linked the Jeffersonian ideal of the citizen-farmer to the new technology of the railroad. The 1862 Homestead Act promised 160 free acres of federal land to any family that would farm it, while massive federal land grants to the railroads financed a national rail system that opened up millions of acres for settlement. Indeed, it was the very success of the Jefferson/Gallatin vision through the 19th century that prompted the second campaign of national planning, which began exactly a century after the Gallatin Plan in 1908 with Theodore Roosevelt’s great conservation initiatives. Haste had made waste, a whole continent of it, as the runoff from bare slopes denuded by massive timber cuts had turned fertile valleys into floodplains; eroded soil bankrupted farmers and choked rivers; plowing of semi-arid land threatened dustbowls; and a poverty-stricken rural population streamed into the already-overcrowded cities. Roosevelt’s “New Nationalism” meant a re-assertion of “the common good” as the motive for national planning. This meant a coordinated effort led by the federal government at the scale of the great river valleys. Forests in the highlands would be protected (or replanted if necessary) to restrain flooding; agriculture reformed to minimize soil erosion; the great rivers tamed by dams that would also provide hydro-electric power. In the West, the dams would collect water to irrigate millions of acres and thus spur a new era of homesteading. If the railroads had concentrated industry and population in the cities of the East and Midwest, a new federal system of navigable inland waterways, irrigation and cheap electric power would reinvigorate the economies of the South and West to create a national balance of prosperity and equity. The interstates completed the regional restructuring that was implicit in the 1908 vision, helping to shift population from the rail-dependent cities of the East and Midwest to Sunbelt regions where systems of federally-financed infrastructure (water, electricity, roads, ports, housing) made possible the explosive growth that has re-shaped this country over the last sixty years. Of course, it is part of the mythology of the South and West today that their growth is due to private enterprise and “rugged individualism.” The great paradox of national planning is that Americans have practiced it so successfully while continually claiming it doesn’t exist. Indeed, one might argue that the remarkable power of planning in this country is proportional to the strength of the barriers it must continually overcome. These include the continent-spanning scale of effective national planning; the centrality of private property and its rights in our economy and culture; and the federal system of government itself with its complex division of powers. National planning in this country has therefore always been innovative and opportunistic, exploiting the flexibility in the federal system to bypass opposition while constantly seeking new coalitions of stakeholders that can advance the goals. When, for example, federal initiatives on the Gallatin Plan in the 1820s-1850s were stymied by the conflict between North and South, the initiative passed to the states that actually built the canals that Gallatin had envisioned. In the 20th century, Theodore Roosevelt announced his 1908 conservation initiatives at a White House conference that brought together all the nation’s governors with members of Congress, the Supreme Court, and even included such “stakeholders” as the industrialist Andrew Carnegie and the populist William Jennings Bryan. Moreover, to carry out the initiatives, the federal government drew on the expertise and support of the great cities, where organizations like the Chicago Plan Commission and the Regional Plan Association of New York had already amassed the planning skills that national planning required. When in 1908 the Inland Waterways Commission published its landmark Preliminary Report, the volume that would set so many of the goals for American national planning for the rest of the 20th century, its authors included as an appendix the 1808 Gallatin Report. This was not mere antiquarianism. 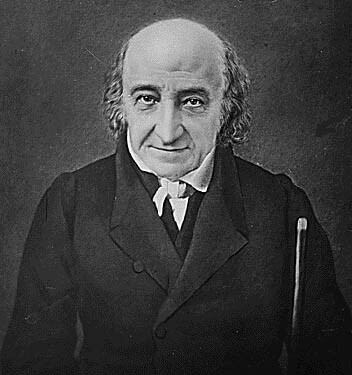 Albert Gallatin’s Report on Roads and Canals had not only achieved over the course of the 19th century the deep influence on the country that the 1908 conservationists hoped to achieve in the 20th; but Gallatin’s Report remained in 1908 (and, I would argue, still in 2008) a model of long-term strategic thinking tied to national policy. The plan clearly identified a set of key infrastructure investments for the federal government, and related those investments to what were perhaps the two most important “policy goals” in the history of the early Republic. The first was Thomas Jefferson’s determination that the vast lands controlled by the national government beyond the borders of the original thirteen states be sold under conditions carefully designed to create a nation of independent small farmers. The second was George Washington’s determination that the newly-settled lands in the American interior be linked to the markets and Atlantic ports of the East Coast to ensure that the United States remained prosperous and united. Washington’s solution to this problem was a coordinated system of canals and portage roads across the Alleghenies, especially one that would connect the Ohio River to a navigable Potomac River; Jefferson replied to Washington’s concept with the enthusiastic concurrence that “Nature then has declared in favor of the Potomac, and through that channel offers to pour into our laps the whole commerce of the Western world.”4 But nature required human assistance, especially canal locks around the Potomac’s five major waterfalls, and Washington soon discovered that even his preliminary efforts to extend navigation required a formal treaty between Maryland and Virginia and elaborate approvals from other states and from the Continental Congress. To settle this dispute Washington convened a meeting between Maryland and Virginia legislators at Mount Vernon in 1785; their dissatisfaction with the barriers that the Articles placed to interstate commerce and “improvements” led them to convene the Annapolis Convention in 1786 to which leaders from the 13 states were invited; the Annapolis Convention then issued the call for a Constitutional Convention to meet in Philadelphia in 1787. The Constitution is thus in a real sense a charter for national planning; the Commerce Clause gives Congress the power to regulate interstate commerce to create, in the words of the preamble, a “more perfect union.” James Madison in his Federalist Paper #14 specifically defended the new Constitution as forming a government that would unite the country through new roads and canals. Nevertheless, the debts and conflicts accompanying the new federal government postponed such national planning until Thomas Jefferson’s administration. Although Jefferson, as we have seen, agreed with Washington’s goals, he had his own strong motives for a national system of roads and canals. From the early 1780s, when the Continental Congress had won control of all the land in the western territories not in the original 13 states, Jefferson had seen this vast unsettled landscape as the potential site of a truly democratic society. He too put forward a plan perhaps even more ambitious than Washington’s: to sell the land in small units for family farms that would be the economic underpinning of a political democracy. He realized that the difficulty for such sales was a subtle one: the inability in an unsettled wilderness to provide clear title and boundaries to small plots. His solution had all the simplicity and rigor of the Enlightenment: a vast land survey to map the whole Western territories on a square-mile “continental grid” oriented to the cardinal points of the compass. Once the base-points had been scientifically established, every inch of land could then be accurately mapped and subdivided. Land to be sold would be grouped into “townships” six miles by six miles (the local political unit for the new territories), and the 36 square-mile “sections” that made up a township would be sold either as complete sections (640 acres), half (320) or quarter-sections (160 acres, thought to be the smallest unit that could support a family). Thus, with a simple set of measurements that even a neophyte surveyor could carry out, Jefferson proposed a “national plan” for a democratic society. The Gallatin Plan, 1808, as reconstructed in D.W. Meinig, The Shaping of America, vol. II (1993). Having advanced a truly national vision, Gallatin was remarkably flexible about the exact federal role in these projects. All would be “private-public partnerships” with the federal government advancing loans or purchasing stock in the canal companies. His hope was that in each case federal funds would overcome the limitations of the private capital market to permit the rapid and coordinated completion of all these projects. That hope was not fulfilled. The War of 1812 drained away (as wars tend to do) the federal surplus that Gallatin hoped would be available for infrastructure. More seriously, the great divide between slave and free states made a truly National System (as Henry Clay and John Quincy Adams styled their later versions of the Gallatin Plan) impossible. Here the supposed weakness of the federal system – its division of powers between the national government and the states – became an unexpected strength for national planning. With the federal government deadlocked, the states took the initiative, led by New York. Governor DeWitt Clinton saw the possibility of a canal far more ambitious than Gallatin’s: a 363-mile link through the Mohawk Valley between the Hudson River at Albany and Lake Erie at Buffalo. With strong support from New York merchants, this remarkable technological achievement was completed in 1825. In the absence of the other canal-road systems that Gallatin had advocated, the Erie Canal profoundly changed the political economy of the nation. 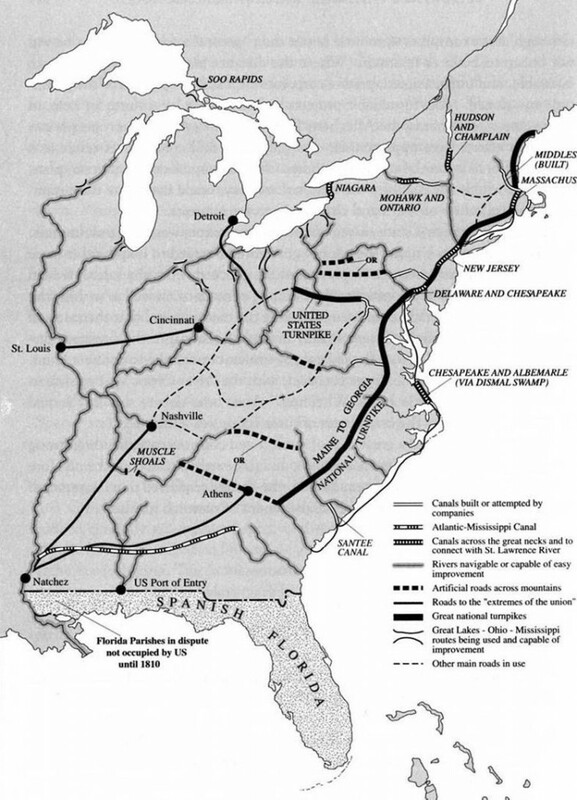 As Washington had recognized in the 1780s, the “natural” route of commerce in the vast Mississippi Valley ran through St. Louis and New Orleans. Although New Orleans was now part of the United States, the nation’s river system still seemed to dictate that the nation’s greatest port city – the port that gave access to the vast commerce that would flow down the Mississippi – would be the great port of the slave system. The Erie Canal in effect turned the nation’s commerce a full 90 degrees. The greatest natural port on the Atlantic – New York – now had direct water access through the Great Lakes into the heart of the very territory that Jefferson had designated for free settlement. Moreover, the Erie Canal gave a new meaning to a swampy village on the shores of Lake Michigan that happened to occupy the narrow ridge between the lake and the headwaters of the Illinois, a river that drained into the Mississippi. The village was called Chicago. With the Erie Canal, Chicago became the key central point on the continent, drawing goods from throughout the Mississippi River basin and transferring them to the Great Lakes system, the Erie Canal and the international trade of the port of New York. Thus the “commerce of the Western world” poured not into New Orleans, as Washington and Jefferson had feared, or into the Potomac ports like Alexandria as they had hoped, but into the capacious lap of New York. 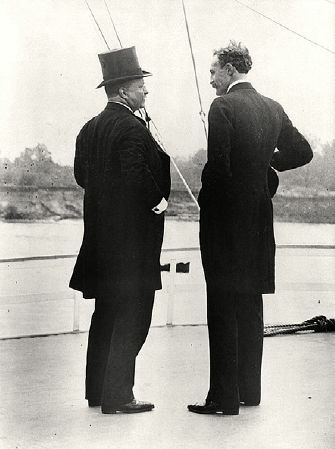 With other states joining the “canal boom” touched off by the Erie Canal, Gallatin’s and Jefferson’s national plan was realized in different form and by different actors. But the federal government regained its direct power over national planning in the 1860s, when the secession of the Southern states in the Civil War broke the deadlock that had paralyzed the national government. With the strong support of Abraham Lincoln, Congress in 1862 passed the Homestead Act that awarded 160 free acres of federal land to any family that would claim and farm it. In the same year Congress passed the Pacific Railway Act, authorizing the first transcontinental railroad (completed in 1869). Lincoln in effect brought to fruition the work of national planning that Washington, Jefferson, and Gallatin had begun. The Homestead Act was Jefferson’s 1784 Land Ordinance on steroids. Further, Lincoln tied this new tide of settlement to federal support for the most powerful technology of the 19th century: the railroad. The massive federal land grants that financed the completion of the national rail grid in the second half of the 19th century accomplished what Gallatin’s proposed federal loans and stock purchases never could: the rapid and coordinated completion of a national transportation system that completed the Gallatin vision at a scale and in a form that Gallatin himself could never have imagined. Nevertheless, the very power of this alliance of the homesteaders, the railroads, and the federal government had unintended consequences that vitiated much of the democratic idealism that underlay the 1808 plan. The millions of acres of railroad land grants meant that most settlers in fact bought their land from the railroads, a process that concentrated wealth in the hands of an urban elite and left many farmers in a state of dependency that Jefferson would have abhorred. Moreover, the railroads became the leading players in an economy of extreme speculation, exploitation and waste that consumed whole forests, tore up fragile prairies for unsustainable farming, and polluted whole river systems. This was not what Gallatin had planned. After 100 years, his vision had run its course, to be replaced by a new national planning initiative. 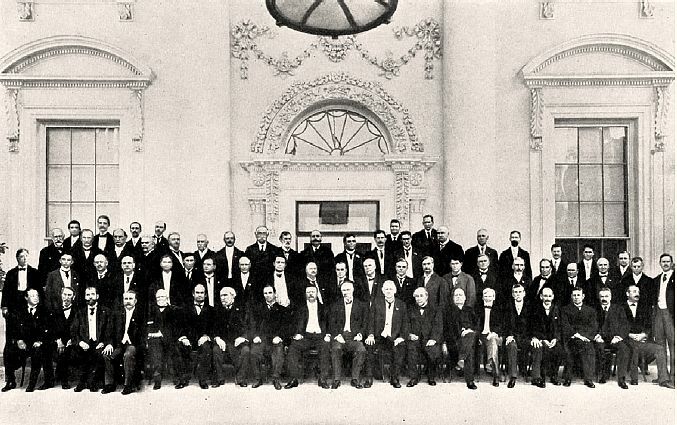 President Theodore Roosevelt (first row, center), governors and other notables in attendance at the White House Governors Conference, May 15, 1908. Notables in the first row include Andrew Carnegie (fifth from left) sitting next to William Jennings Bryan (sixth from left). Justice Oliver Wendell Holmes, Jr. is seated fifth from right. From the conference proceedings (1908). The agenda for this unprecedented meeting was set by a now-forgotten document whose unpromising title was the Preliminary Report of the Inland Waterways Commission. And yet this 1908 publication, more than any other, initiated the new era in national planning that would supersede the exhausted principles of the Gallatin Plan and offer a vision for the 20th century. This Report not only translated the progressive ideals of the conservation movement that had been building over the last decade into a coherent framework for national action that would put the “common good” over private profit. But the report also encapsulates a highly strategic understanding among the scientists who were its authors and the politicians who were its sponsors that the inland waterways were the strategic site for a comprehensive effort in national planning that had the power to conserve natural resources and bring prosperity to the neglected regions of the United States. We have since learned the many environmental costs of dams and irrigation projects, but to Theodore Roosevelt and the other Progressives a great dam signified a triumph of the wise and daring use of advanced technology in the public interest. For them, the dams were the central monuments in a program of what we would today call “sustainable economic development” at a regional scale. A pervasive theme that would extend from TR’s “New Nationalism” to FDR’s New Deal was that the 19th century alliance of the federal government and the railroads had fostered “monopolies” that had concentrated development in the great industrial cities of the Northeast and Midwest and, through discriminatory freight rates and other disincentives, had reduced the South and West to mere “colonies” providing cheap raw materials. This economic exploitation had in turn encouraged the inefficient exploitation of natural resources, as poor farmers were forced onto marginal lands, lumbermen overcut forests, and miners pillaged mineral resources to supply the great cities. Conservation for both Roosevelts and other Progressives thus meant fundamental economic reform to break the monopoly power of the railroads and the “trusts” and spread economic equity throughout the country. Despite the idealism, science, and political power that lay behind this Declaration, the new era of national planning it announced would be marginalized for the next twenty-five years. The successful implementation of the public dam-water-and-power concept at the appropriately-named Roosevelt Dam over the Salt River near Phoenix was completed in 1911, but Roosevelt’s successors mistrusted the use of federal planning power he had championed, and the private electric utilities in particular proved to be bitter enemies. As with the Gallatin Plan, the Roosevelt “National Conservation” plan fell victim to a deep split in American society, in this case over the proper boundaries between private and public enterprise. Only the Colorado River Compact of 1922 and the Boulder (now Hoover) Dam begun in 1931 escaped this deadlock. And, as in the Gallatin Plan, the full potential of the plan was only realized decades later after a national trauma had broken the federal deadlock: for the Gallatin Plan, the Civil War, for national conservation and development, the Great Depression and the coming of the New Deal. 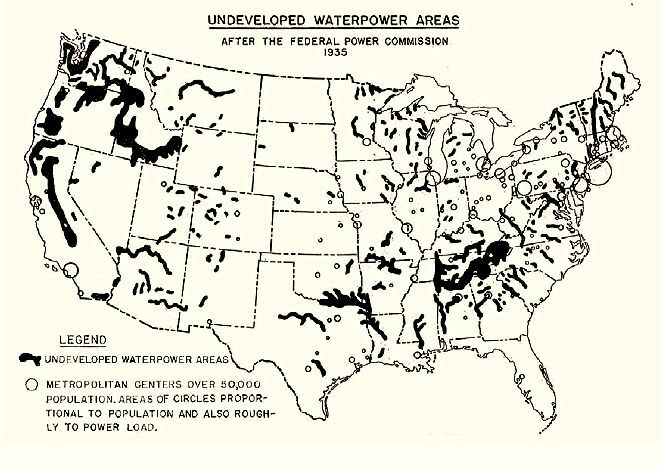 This dramatic map of “undeveloped water power areas” suitable for hydro-electric dams shows clearly the federal dam program as a development tool for “undeveloped” regions of the South and West. scientist Charles Merriam had been the leading advocate for regional planning in Chicago and planner Charles Eliot II had played a similar role in Boston and Washington, D.C. These city and regional connections were no coincidence. Just as in the early 19th century when the states took up the task of canal building when the federal government was deadlocked, so in the early 20th century, the nation’s urban leadership took up the task of planning for the new society, but at the city and regional level. The Chicago and New York plans were the best existing models for long-term intensive planning for conservation and development. These plans projected and coordinated massive infrastructure development for clean water, clean air, road and rail improvements, even the conservation of “forest preserves” and open space at their edge. Now this expertise would be used for national conservation and development. 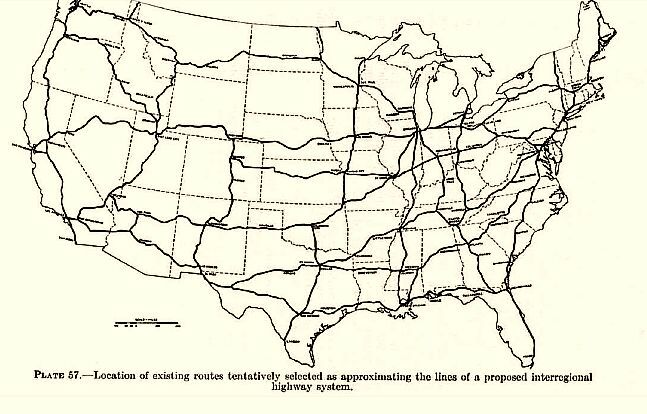 The first map of a national interstate highway system. From Toll Roads and Free Roads (1939). Just as Lincoln in the 1860s had allied the federal government with the most advanced technology of the time – the steam locomotive – to promote the settlement of the nation, so FDR had allied the federal government with the hydroelectric dam, the regional electric grid, the internal combustion engine, and the superhighway to develop the South and West. Bringing the most advanced 20th century systems of power and transportation to the relatively “backward” regions of the country was indeed wonderfully effective in re-structuring the geography of population and economic growth. Indeed, I would argue that this massive exercise in national planning gave American capitalism its “second wind” after the Depression and World War II, and has been the most important initiative in creating the country we know today. As I have tried to show in this paper, national planning in the United States is difficult but it works. Twice in our history our leaders have managed to overcome the inevitable constraints – regional and sectional divisions, private-public conflicts, divisions of power, the sheer magnitude of the task of transforming a continent – and crafted national plans whose visions have had the galvanizing power to coordinate action over the long term. I have used the dates 1808 and 1908 as shorthand for these two great national efforts. A century later, we await a new vision and a new call. Alexis de Tocqueville, Democracy in America, ed. Richard D. Hefner (New York: New American Library, 1956; original published in 1835 and 1840), p. 108. Albert Gallatin, Report to the Senate on Roads and Canals [April 1808], reprinted as Appendix 17 in Preliminary Report of the Inland Waterways Commission (Washington, D.C.: Government Printing Office, 1908), pp. 535-581. Washington to Jefferson, March 15, 1784, Jefferson Paper, “American Memory” website, Library of Congress. Jefferson to Washington, March 29, 1984. op. cit. Gallatin Report, pp. 535-560. See especially Michael J. Lacey, “Federalism and National Planning: The Nineteenth Century Legacy,” in Robert Fishman, editor, The American Planning Tradition: Culture and Policy (Baltimore: Johns Hopkins, 2000). Pp. 89-146. Anyone who knows this remarkable essay with more than a book’s worth of thought and research, will recognize my debt to Lacey, who served as Director of United States Studies at the Wilson Center. Theodore Roosevelt, Address to the National Editorial Association, June 10, 1907. Roosevelt Papers, American Memory Website, Library of Congress. Theodore Roosevelt, “Call to Governors Conference, Memphis, October 3, 1907. Loc. Cit. Preliminary Report of the Inland Waterways Commission, pp. 1-32. Philip Selznick, TVA and the Grass Roots (New York: Harper Torchbacks, rev. ed. 1966). Alan Brinkley, “The National Resources Planning Board and the Reconstruction of Planning,” chapter in Fishman, editor, The American Planning Tradition, pp. 173-192. John H. Crider, “$8,000,000,000 Highway Project Wins Encouragement of Roosevelt, New York Times, Feb. 7, 1938, p. 1. Toll Roads and Free Roads (Washington, D.C.: Government Printing Office, 1939). Theodore Roosevelt, “Call to the Governors Conference,” loc. cit.